The Goblins are in the process of rebasing. The priority has been is to use them for DBA armies, where their lack of fit is so extreme it doesn’t matter. I’ve also cannibalized some of the figures for SBH as well. His snivelling underling adds to his general wickedness. 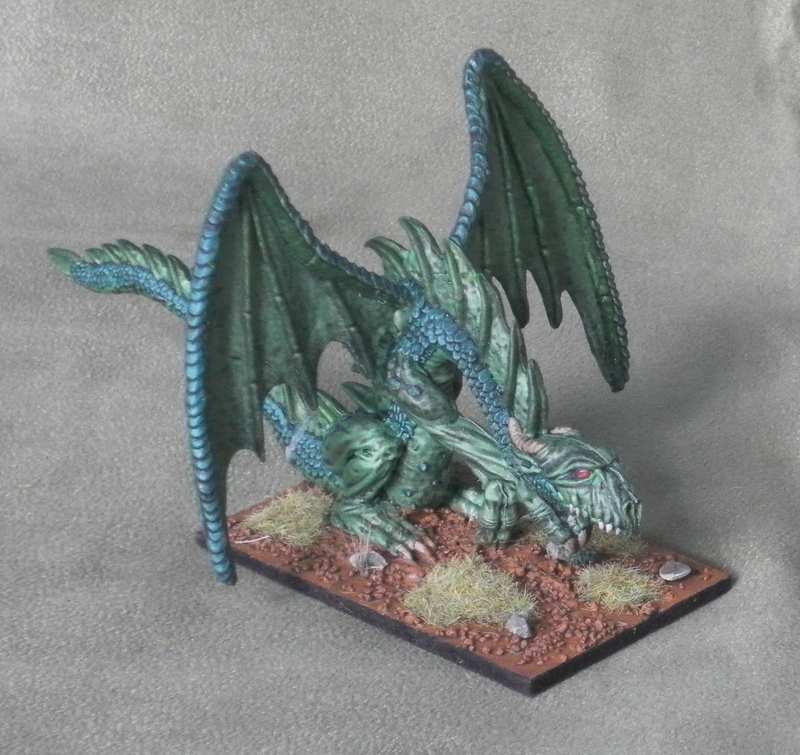 A very evil green dragon. 3 x Fl (Bats). The big bat could be a cmd if these were a separate ally. 1x Bs (wolves). 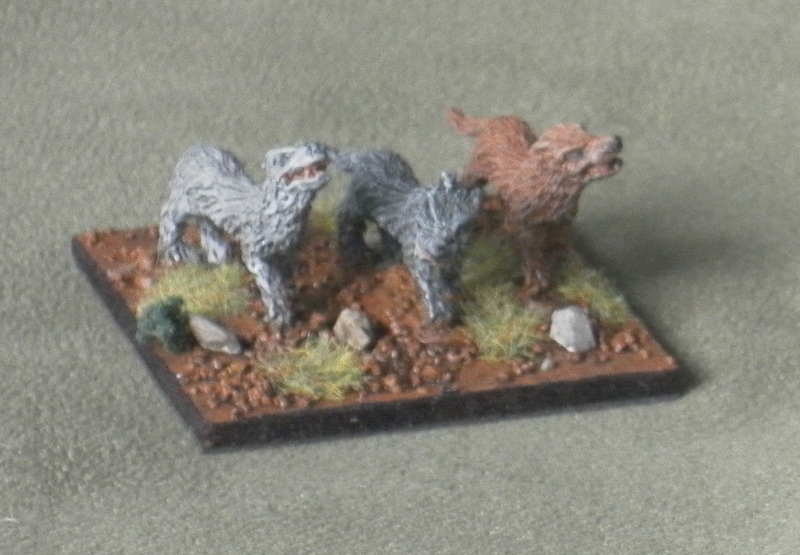 I’ve ordered some Copplestone wolves that I expect will make these look rather mangy. If you look at the little goblins in the 7Hd elements you’ll see that they don’t really look evil enough to be orcs; they’re more mischievous, than evil, so definitely goblins. I really like the overseers with whips at the back of the 7Hd. I need to get a few more painted now! Goblin hordes with goblins and hobgoblin overseers. I decided to give the armoured figures a green scale lamellar armour. This was partly because I had a ‘scaly green’ colour that I could see no use for, but as it turned out it sort of went with their skin colour. I mixed the green with silver to make it metallic. I also mixed ‘tin bitz’ with ‘boltgun metal’ for all their armour and weapons, though the effect is not so obvious. The shields were ones I added after I painted the first element. I felt they needed a bit more colour. They’re made using a hole punch from fairly thin cardboard that I ‘painted’ using a thick marker (a technique I use to do the sides of the bases). The pattern is one that we used for D&D goblins a very long time ago. It’s crude and unfussy, appropriate for goblins, which allowed me to do the shields in production-line fashion very quickly. They’re glued on with PVA. One of the little goblin figures has a trident and net. I didn’t like how the net looked so sawed them off and made it look as though the figure is throwing a rock of some sort. The Wolfrider command has a minor conversion. 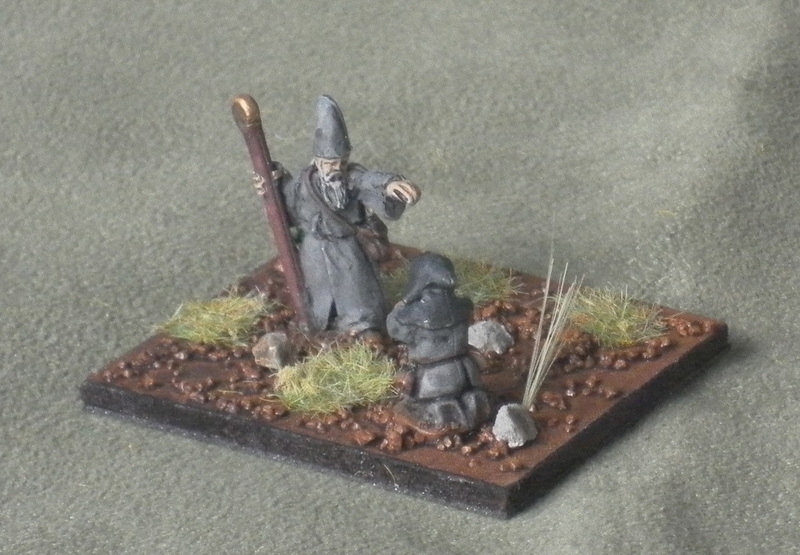 I used the banner from a dwarf command figure and glued it onto a figure with a spear (the dwarf now has a hammer made of green stuff). In DBA terms I’m using the behemoths as elephants, the wolfriders as 3Cv, the spiders as 2LH, the spear as 4Sp or 4Pk, the unarmoured warband as 3Ax, the armoured one as 3Bd, and the archers as 3Bw or 2Ps. Of these, only the spiders are a little dubious. 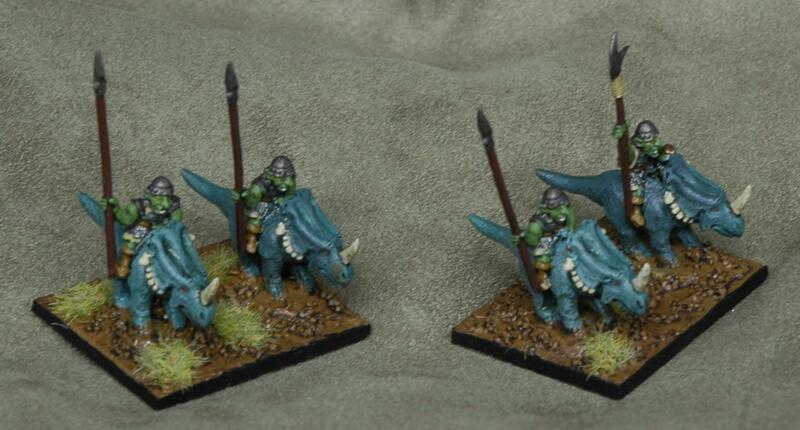 The army now has knights (dinoriders or goblins on rhinosaurs) and chariots (wolf-drawn battlecarts). The can morph as Classical Indians (Classical Goblins), Ghaznavids (or Gobnovids), and Samanids (Shamanid Goblins). I’m working on getting a couple of proper 2LH soon. 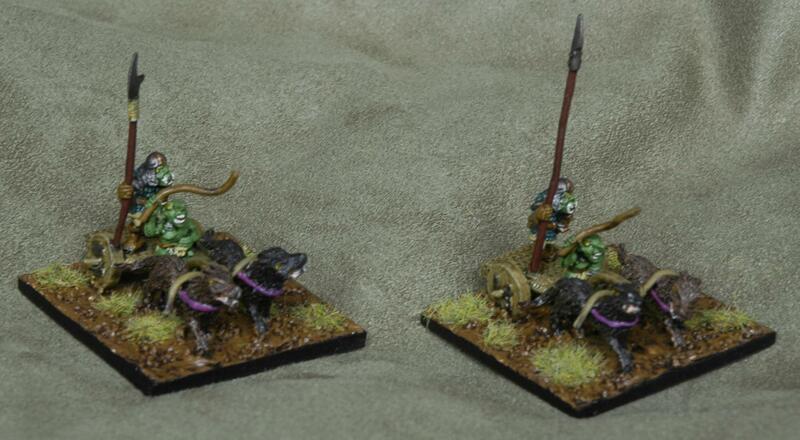 Shamanid Goblins: 3Ax on the left and the spider as 2LH! A very impressive lineup! I look forward to hearing more of their exploits. Indeed! I need to find a way to use hordes effectively—until then at least they die well! 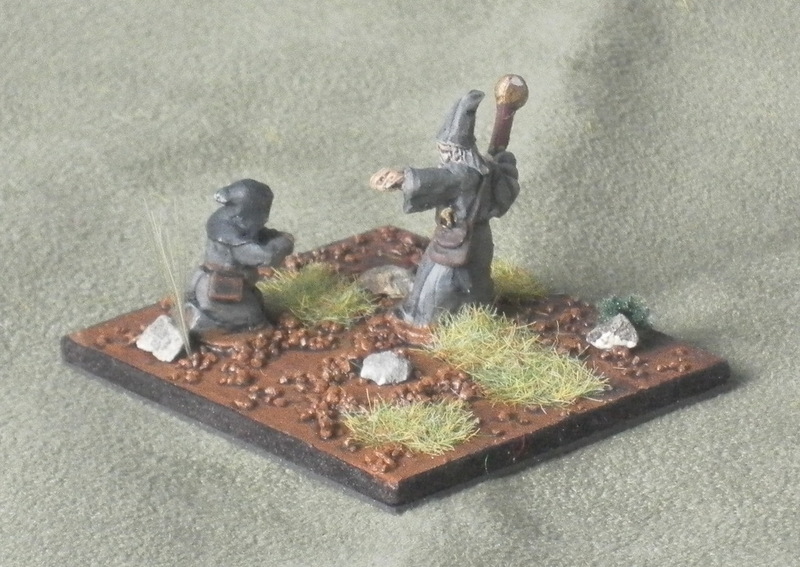 Having a revisit to your early stuff and came across these goblin armies. I really like them, and would like to see you get them out of their box again and added to. Thanks. I should get those chariots and knights done. 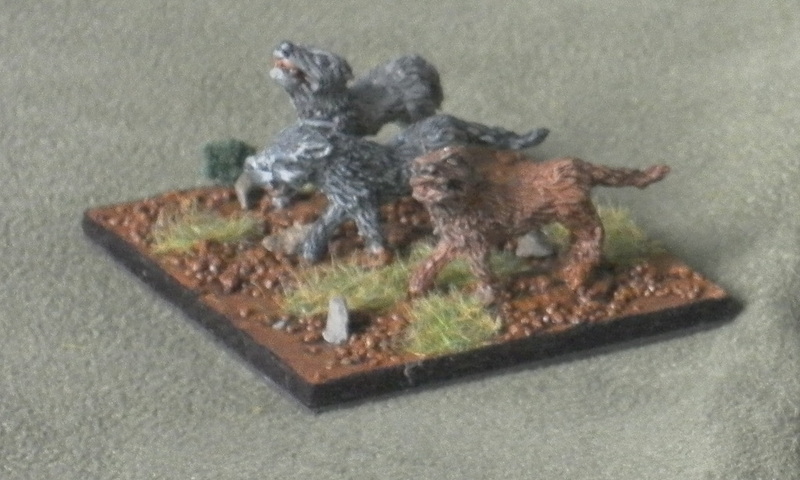 However, as I’ve not found anyone else to play 15mm HOTT, they’ve not been such a priority. What’s more the other HOTT armies that I started have been broken up into SBH warbands! 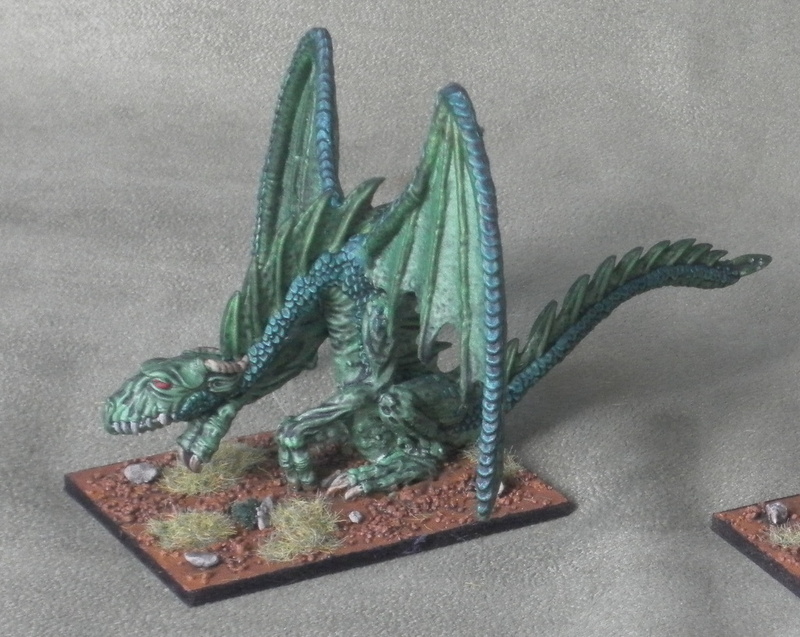 There are some lovely fantasy figures waiting to be painted (and Demonworld are back in production! ).